Breakfast casseroles are one of the most versatile dishes to make for a group. 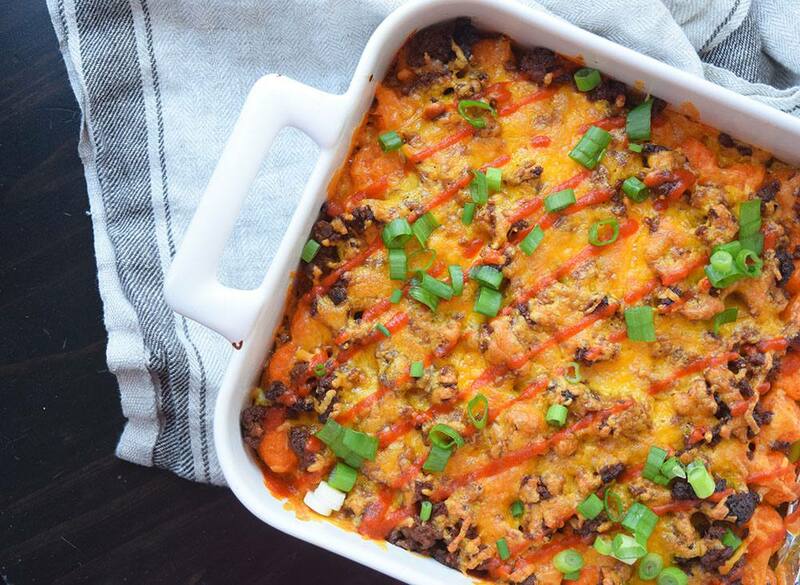 This hearty dish calls for sweet potato tater tots, cheddar, and spicy chorizo, but you can easily substitute other meats and cheeses—and even sneak in some veggies! This refreshing smoothie can serve as a great breakfast drink or even a light breakfast in and of itself on Thanksgiving morning. It goes well with scones and muffins and the cranberry juice in the recipe even brings a little traditional fall flavor. Bonus: You can sip it while doing dinner prep. It's easy to see why pumpkin and cream cheese are such good friends when you taste these muffins. They're sweet and rich, almost like a pumpkin cheesecake, perfect for munching on while watching the parade. If you're looking for a special Thanksgiving breakfast you can just pop in the oven in the morning, this overnight French toast casserole is it. Prep the entire thing the day or night before, pop it in the fridge overnight, and simply bake it in the morning. This waffle sandwich isn't a make-ahead recipe, but it is perfect for Thanksgiving breakfast, because it's quick, easy and—most of all—a real crowd-pleasing treat. Peanut butter is smeared over toasted waffles and topped with fresh blueberries, raspberries or strawberries. There's no better way to start Thanksgiving day than with these sweet and buttery pumpkin scones. The flavor and texture of these scones rivals that of any you would buy in a bakery or coffee shop. A strata is another make-ahead recipe that works great for busy mornings. If you're serving vegetarians, feel free to use sauteed mushrooms instead of the corned beef. Day-old bread always works best for this dish. If you're looking to impress out-of-town guests, try a Dutch baby pancake. It looks fancy, but all have to do is pour the mix into a baking dish—no flipping needed! Quiches are perfect for holidays because it tastes best when it is made in advance. You can prepare this recipe weeks in advance and freeze it. The combination of bacon and cheese is a winning one. These spiced pumpkin fritters taste like fall in every bite. The recipe comes together easily, and fry in batches of 5 to 6 for just a few minutes.